These instructions were written for BHODemon 2.0.0.19, but should work for other slightly later versions as well. If you haven't already downloaded BHODemon, do so. The software can be downloaded from the developer's website at http://www.definitivesolutions.com/bhodemon.htm, from PC World, or can be obtained from this site. The version available from this site is not guaranteed to be the latest available version. Double-click on the installation program, e.g. 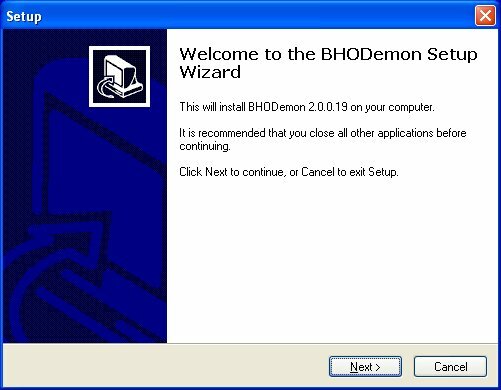 BHODemon20Setup_2019.exe, to start the installation. You will see a welcome screen. Click Next to proceed with the installation. If the default installation directory, C:\Program Files\BHODemon 2 is acceptable, click on Next. Otherwise, click on Browse to select an alternate location and then click on Next. 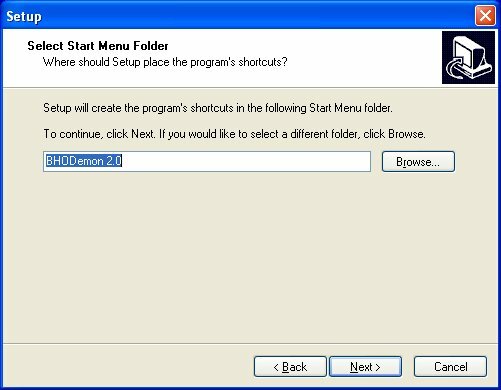 Unless you want to change the name of the menu folder from the default of "BHODemon 2.0", just click on Next at the next window. If you want an icon on your desktop, check the "Create a Desktop icon" option on the next window. You also have the option of selecting "Create a Quick Launch icon, i.e. an icon that will be immediately available when you click on the Start button. When you've made your selections, if any, click on Next. The next window will show you the destination location and the start menu folder you selected. You can click on Back to change these selections or click on Install to proceed with the installation. The last window that will appear gives you the option to view the help file and launch the program. You can click on Finish to proceed. When you start the program, you will see a list of Browser Helper Objects (BHOs) that are installed on your system. Those that are marked as enabled will be used by Internet Explorer. If the ones installed are innocuous then they will show a status of "Benign" and the status block will be green for those items. Click on the Check for Updates button to make sure you have the lastest updates for BHODemon and then click on the Refresh button to have the system checked for BHOs again. For those BHOs that are labelled as "Malware" with a red status block, uncheck the "Enabled" block. You may also want to disable any labelled as unknown, especially, if the names seem to be just a random combination of letters and perhaps numbers, since some adware/spyware programs try to hide themselves from adware/spyware removal programs by using random names. When you've finished, click on the little yellow demon head in the upper left-hand corner of the window or on the "-" in the upper right-hand corner of the window to minimize BHODemon. An icon will then appear in your system tray (in the lower left-hand corner of your screen on most systems) indicating BHODemon is monitoring changes to BHOs on your systems. I've noticed, thanks to BHODemon, that while Spybot Search & Destroy was removing some spyware, the spyware was apparently re-enabling itself and re-inserting itself as a BHO with another random name.